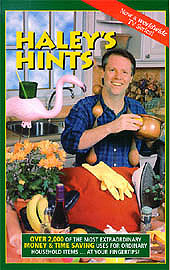 Haley's Hints - Household Cleaning Tips - Save You Money! OVER HALF A MILLION SATISFIED READERS! 400 FASCINATING PAGES OF HANDY HOUSEHOLD MONEY SAVING CLEANING TIPS! OVER 2,000 TIME & MONEY-SAVING SOLUTIONS TO COMMON HOUSEHOLD CLEANING PROBLEMS! FROM KITCHEN TO GARDEN TO WORKSHOP ... SOLUTIONS FOR ALL YOUR CLEAN-UP NEEDS! 36 PAGE EASY-FIND INDEX ... SOLVE EMERGENCY PROBLEMS IN SECONDS! EASY-TO-READ PAGES WITH HUNDREDS OF ILLUSTRATIONS & DIAGRAMS! Purchase your copy of the Haley's Hints Book online now! Notice: This website is not operated by nor affiliated with Haley's Hints or 3H Productions.